Delays are plaguing Google's Nexus 7 tablet with 16GB of storage as some stores have stopped taking orders or delayed shipments of the product. The tablet has been unavailable on Google's website since the middle of this week after running out of stock, and was still not available for order on the Google Play store as of Friday. Availability of the tablet is becoming even tougher as retailers like Staples and Office Depot have stopped taking online orders, while GameStop and Adorama have delayed the shipping dates for the tablet to the middle or end of August. a Google spokeswoman in an e-mail on Friday. "We haven't shared a timeline," she said. An 8GB version of the Nexus 7 tablet is still available for $199 in the Google Play store. The 16GB tablet, which is priced at $249, started shipping on July 13, but issues mounted almost immediately with retailers like Staples, GameStop and Adorama struggling to meet shipping commitments after receiving limited stocks of tablets. Staples has now stopped taking orders for the 16GB tablet, putting it on "special order" and asking buyers to check in-store for availability. Staples earlier delayed shipments by a few days after the tablet started shipping, but was still taking orders. Staples has also put the 8GB Nexus 7 on special order. GameStop, which is one of the retail stores Google partnered with for Nexus 7, is taking orders for the 16GB Nexus 7, but is promising shipping dates after three or four weeks. Earlier this month the company stopped taking orders for the 16GB Nexus 7 tablet. The 16GB Nexus 7 is also out of stock on Office Depot's website, and the retailer is not taking orders, asking buyers to "check back soon." GameStop and Office Depot are not yet selling the 8GB Nexus 7. Retailer Adorama, which has retail stores in New York City, is taking orders for the 16GB Nexus 7, and is providing a tentative ship date of mid-August. But small stocks of tablets are trickling into some stores. HMV earlier on Friday announced via Twitter that 10 units of the tablet were available in its Blackpool, UK store. Some Canadian stores also announced through Twitter that the Nexus 7 tablet was in stock. The highly anticipated tablet has already started reaching buyers who ordered the tablet as soon as it was announced in late June. The price and features attracted many buyers, and enthusiasts also ordered the tablet to get a taste of Android 4.1. At prices starting at $199, the tablet was an impulse purchase for iPad owners who want to try out Android, which has largely been unsuccessful in tablets. 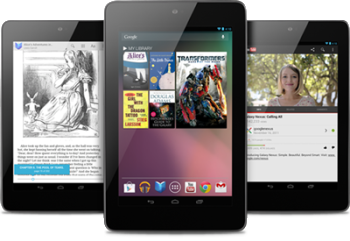 The Nexus 7 has been made by Google in collaboration with Asus. The tablet weighs around 340 grams and offers battery life of up to nine hours on video playback and 300 hours on standby. The screen can display images at a 1280 by 800-pixel resolution. Additional features include a 1.2-megapixel front-facing camera, Wi-Fi, Bluetooth and NFC (near-field communication).